My husband and I had a nice treat this weekend - dinner out and a movie at our local recliner theater. Our son had given us a Fandango gift card for Christmas, so we saw bought 2 tickets for the recliner theater on a Saturday night...all for $1! We'd been waiting for Red Sparrow to come out (it was just released on Friday), and though we were disappointed to hear some critical reviews, we still wanted to see it. We're glad we did! We both enjoyed this exciting Russian spy thriller starring Jennifer Lawrence. Lawrence plays Dominika, the star of the Russian ballet whose career is cut short by a horrible accident. As a prima ballerina, Dominika and her mother were supported by the state, which paid for their apartment and all of her mother's extensive medical bills. When Dominika's career ends, her (evil) uncle Ivan tells her that the state will continue to support her and her mother if she does something for them. She is supposed to just change out a man's cell phone for another one, but things go horribly wrong and soon Dominika finds herself facing a far worse choice: die for what she knows or join the ranks of Russian spies. With no other options, she joins the Sparrow program, a humiliating and intense program the Russians use to train young spies to use their bodies to manipulate people. After her training, she is assigned to get close to an American CIA agent named Nate Nash, played by Joel Edgerton, in order to find out who is the CIA's mole in the Russian government. That's just the set-up of this complicated, twisty plot. Filled with fake-outs, double-crosses, and other staples of the spy genre, this gripping thriller kept us glued to the screen, wondering if there was any possible way for Dominika to come out of this alive and intact. On the downside, there is a LOT of violence in this movie, including sexual violence and two horrific scenes of torture. I had my eyes covered several times! The plot was gripping, though, and the acting was good. True, Jennifer Lawrence is clearly not Russian, but let's face it - in real life, Russians don't talk to each other in Russian-accented English, either - you just have to suspend disbelief a bit and go along for the ride. And what a ride it is! The plot twists keep you guessing until the last moments of the film, with plenty of action, intrigue, and suspense along the way. 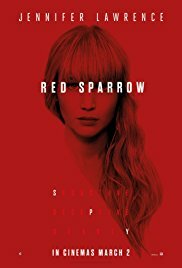 Red Sparrow was just released March 2, 2018, and is out in theaters now. Check Fandango for showtimes and theaters near you or to buy tickets. It is planned for release on both DVD (pre-order now) and streaming through Amazon in June 2018. I'll add this one to my movies to see list. Sometimes I am just in the mood for a good spy movie.